Dr. Taz Bhatia is a board-certified integrative medicine physician and wellness expert specializing in women’s health, weight loss, nutrition and family wellness. She is the author of “What Doctors Eat,” “The 21 Day Belly Fix,” and the recently released “Super Woman RX.” In this episode we talk about her evolution from a physician to functional medicine and empowering women to reach their full potential and be the best versions of themselves. 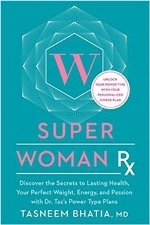 Click here to download an mp3 of "The Super Woman RX with Dr. Taz Bhatia". Here's a video version of the interview I did with Dr. Taz.